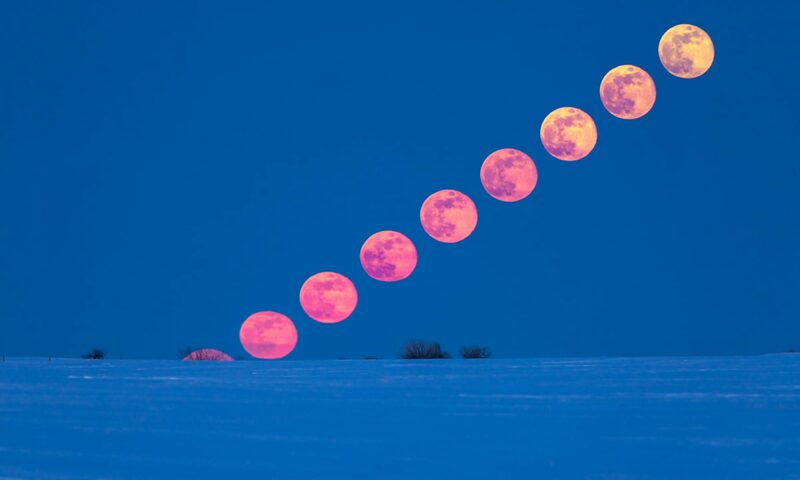 The Hunter’s Moon of 2014 turned deep red during a total lunar eclipse. It wouldn’t be an eclipse without a chase! 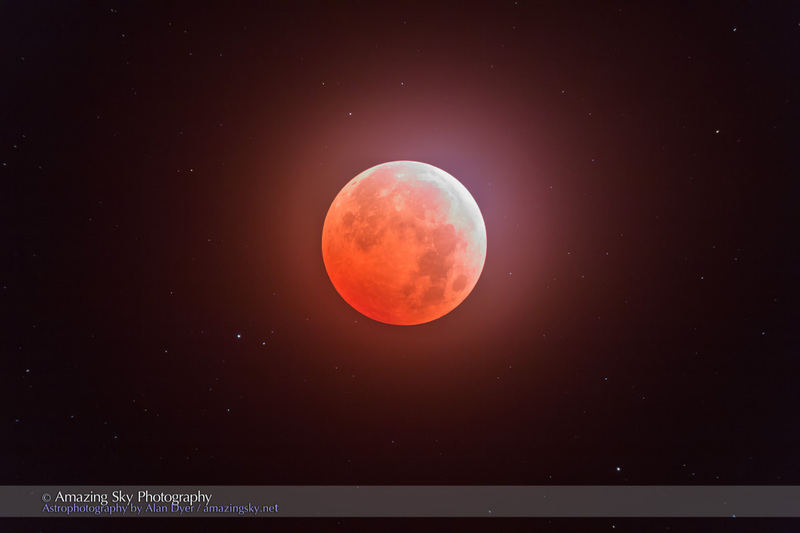 To see and shoot this total eclipse of the Hunter’s Moon I had to chase clear skies, seeking out the only clear area for hundreds of miles around, requiring a 3-hour drive to the south of me in Alberta, to near the Canada-US border, at Writing-on-Stone Provincial Park. It was worth the midnight trek, though I arrived on site and got set up with just 10 minutes to go before the start of totality. But I was very pleased to see the sky remain mostly clear for all of totality, with only some light haze adding the glow around the eclipsed Moon. Remarkably, the clouds closed in and hid the Moon just after totality ended. This is a single 15-second exposure at ISO 400 with a Canon 60Da, shooting through an 80mm apo refractor at f/6 and on an equatorial mount tracking the sky at the lunar rate. I shot this shortly after mid-totality. It shows how the Moon’s northern limb, closest to the edge of the umbral shadow, remained bright throughout totality. It shows lots of stars, with the brightest being greenish Uranus at the 8 o’clock position left of the Moon, itself shining in opposition and at a remarkably close conjunction with the Moon at eclipse time. More images are to come! But this is the result of fast processing after a dawn drive back home and an all-nighter chasing and shooting an eclipse. You may have found the only clear skies in Alberta, for that we Thank You. Marion & I drove around Central Alberta with just a tiny bit of luck. A fleeting band of clear skies 30 minutes prior the the eclipse start time had us hoping for a repeat of the spring eclipse & the skies clearing near totality, but it was not to be. A few attempts to capture a portion of the eclipse resulted in a burnt orange haze lacking definition, truly disappointing, but expected. While photography was out of the question, viewing the event together was worth the drive & a sleepless night. Marion had to work this morning so a road trip was not possible. No pictures this time around, however we watched 2 for 2 this year & with any luck we’re hoping to complete the tetrad next year. Looking forward to your updates after a snack & some sleep. Keep in mind we have two more next year: April 4 in the pre-dawn like this one, and Sept 27 in the early evening. That’ll be popular! It’s a super moon as well! Alan: Well worth driving that distance. You’ve got the stamina it takes to achieve such a wonderful portrait of the moon. I thought so Lawrence. I was pleased. For once the clouds held off until after totality. They were very well behaved.